Starting with the Fonepad Note 6E, ASUS has a 6” 1080p Super IPS+ display with up to 450 nits brightness and 10-point capacitive touch. The “Note” aspect reflects the inclusion of a stylus, presumably with an active digitzer layer. The basic idea is that the Fonepad is designed for people that want the larger screen a tablet offers and they don’t want to carry around a smartphone; paired with a Bluetooth headset, all you need is a purse, briefcase, or a large pocket and you can have your proverbial cake and eat it to (sort of). The Fonepad 6E measures 164.8mm x 88.8mm x 10.3mm and weighs 210g, so about 3cm longer and 1.5cm wider than the Galaxy S4, and just slightly thicker and 50% heavier. ASUS notes that they have several custom apps designed for stylus input as well. 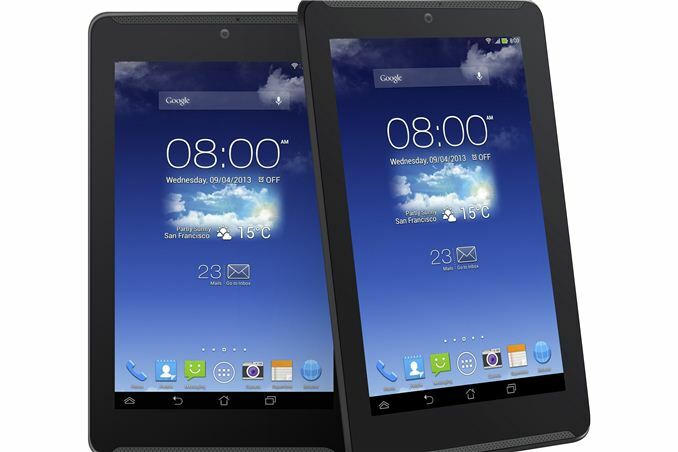 The core hardware in the Fonepad 6E is an Intel Atom Z2580 Clover Trail SoC, which is a dual-core + Hyper-Threading CPU that runs Android 4.2 at up to 2.0GHz with a 400MHz GPU. Battery life from the 3200mAh battery is rated at up to 23 hours 3G talk time and 6.5 hours of video playback. The 6E includes a 1.2MP front-facing camera and an 8MP rear-facing camera, 2GB RAM with 16/32GB onboard storage and a microSDHC slot, 2.4GHz 802.11n with Bluetooth 3.0, and micro-USB, micro-SIM, and 3.5mm headphone/microphone jacks. Cellular connectivity consists of UMTS 850, 900, 1900, 2100MHz (Europe & US), GSM/EDGE 850, 900, 1900, 2100MHz (Europe & US), and HSPA+ with 42Mbit/s DL & 5.76Mbit/s UL. A-GPS with GLONASS is also present. Pricing and availability are still pending, but the Fonepad 6E is planned in white and black versions. 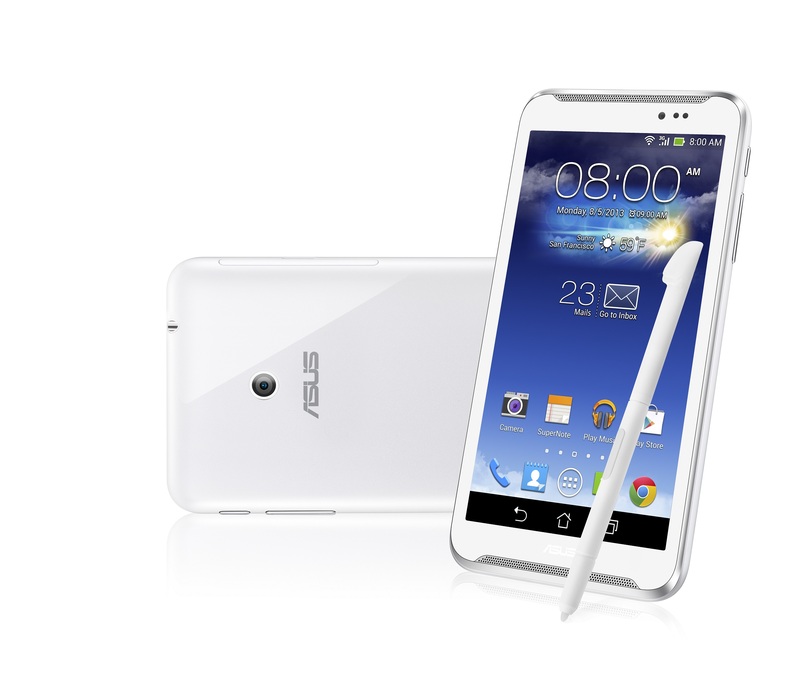 For the big brother Fonepad 7E, ASUS moves up to a 7” IPS display but drops the resolution to 1280x800. The 7E should be priced lower than the 6E based on the features and specifications, as it comes with a slightly slower Atom Z2560 (dual-core + Hyper-Threading at up to 1.6GHz) SoC, 1GB RAM, 8/16/32GB onboard storage (with microSDHC slot available for more), 5MP rear/1.2MP front cameras, and no stylus. Basically, everything is cut down from the 6E, except for the size and battery. The Fonepad 7E measures 196.8mm x 120mm x 10.5mm and weighs 340g, and the 3950mAh battery is rated at up to 10 hours of battery life for 720p video playback. The included ports are the same as the 6E (micro-USB, micro-SIM, and 3.5mm headphone/microphone jacks), and WiFi support is also 2.4GHz 802.11n with Bluetooth 3.0. Cellular connectivity is nearly the same as the 6E, with the only difference being the lack of 2100MHz GSM/EDGE support. 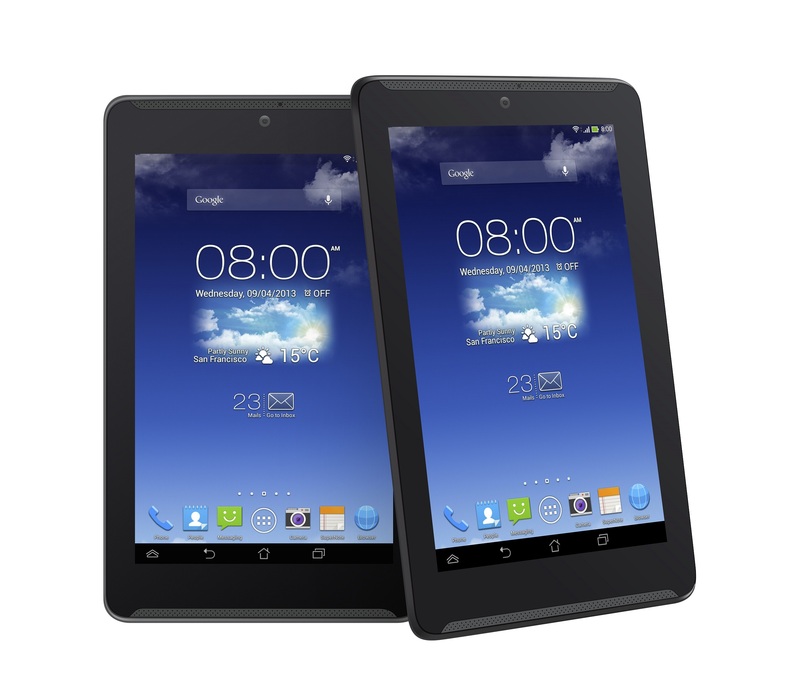 We’re again waiting for information on pricing and availability, but the Fonepad 7E will launch in sapphire black and diamond white versions. Man, how disappointing... there still isn't anyone making a 7" or 8" high-end phablet with 1080P and Micro-SDXC for playing back 1080P videos that you shot on your smartphone. It looks like the Sony Xperia Z Ultra at 6.4" is as close as we're going to get for now. But, the ZU doesn't have a tool-less removable back cover and battery, hence it is inferior to the state-of-the-art. That is unless you believe Sony's claims that the ZU is waterproof and thus worth the trade-off of not having removables. Samsung presumably has all of the neccessary technologies available to them, except the water proof stuff, but they went cheap on the Note 8.0 with a low-rez screen, among other things that aren't up to flagship class. And now Asus tries to slide "yester-decade's" Micro-SDHC slots (instead of Micro-SDXC slots) and low-rez display panels (instead of 1080P panels) past our discerning noses. No sale. Heh, both these phones beat my Asus netbook hands down. I love the way tech progresses. "GSM/EDGE 850, 900, 1900, 2100MHz (Europe & US)"
Are you sure about thaat? For all I know, Europe uses 1800 and NOT 2100MHz for GSM/EDGE. I can bet you at least half of Asus' potential sales in the mobile market are due to these horrible and confusing names.